Feeling anxious for your next dental appointment? Our caring Mississauga dentists will make you feel as comfortable as possible at every appointment. We can help ease the anxiety of our more anxious patients with sedation services including laughing gas, oral sedation and full sedation. We understand that a trip to the dentist may cause anxiety in some people. Our goal is to help alleviate some of that anxiety so that it doesn't prevent you from visiting our dentists to help you maintain your best oral health. At Kerhoulas Dental we do our best to offer a warm, inviting environment for your entire family to have a positive dental experience. 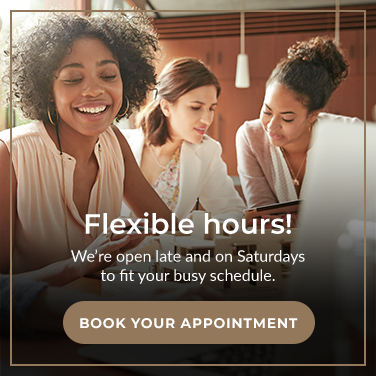 If you're typically nervous about visiting the dentist, please let our reception team know when you're booking your first dental appointment. Our staff has been helping nervous patients with their dental anxiety for years, and will do everything they can to ensure that you feel comfortable throughout your appointment. In each of our exam rooms you may listen to relaxing music throughout your appointment. For the majority of our anxious patients, these 'distractions' help them focus on other things and ultimately make their dental experience less frightening. Our entire dental team will take the time to explain the details of all your dental procedures so you will have a solid understanding of the treatment we are recommending. We welcome your questions and we encourage you to ask as many as you want until you are fully comfortable to proceed with your appointment. Prior to your appointment, we may discuss some signals that you can give to our dentists to communicate that you need a break or would like to stop at any time during your visit. To help our most anxious patients, we offer sedation options, including nitrous oxide (laughing gas). If you believe you may require laughing gas during your appointment, we will review all the pros and cons with you and proceed accordingly. Your comfort is our priority. If you feel nervous about visiting the dentist, we welcome you to contact us at Kerhoulas Dental in Mississauga.